Home / Does Your Senior Dog Have Arthritis? Does Your Senior Dog Have Arthritis? Dog arthritis is common. In fact, some sources say 1 in 5 dogs will develop the painful joint disease in their lifetimes. Chalk it up to aging joints in your senior dog but that’s not the whole story. Hip dysplasia and other joint problems can lead to arthritis in younger dogs too. Who’s at Risk for Dog Arthritis? Overweight dogs are more apt to develop the achy and stiff joints associated with arthritis because their joints are supporting more weight than they are meant to. Large breeds like Great Danes are more affected. One symptom of arthritis is frequent limping. Another is difficulty getting up after resting or swollen joints. If your dog starts “slowing down”, it may be due to arthritis or another issue and it’s worth visiting the vet. Your vet can diagnose it with Xrays and prescribe omega 3 fish oil, glucosamine chondroitin or prescription pain killers. There’s even surgery available. Only you can decide what’s best for your pet but no matter what, your pet will benefit from regular exercise. Moderate and regular exercise will help your pet feel better. Frequent exercise prevents joints from becoming overly stiff. Plus, exercise helps maintain weight. Help your dog maintain flexibility by getting out and about. But don’t overdo it. A couple of laps around the block at a time may be enough. If you haven’t been exercising regularly, it’s better to start slow and build up endurance. Regular exercise will keep your dog active. This improves digestion and helps him sleep better. It will also give your pooch something to take his mind off pain. Your dog will enjoy going outside and sniffing the neighborhood. When planning your schedule, think frequency rather than an endurance test. For instance, two 10-15 minute daily walks are better than one long walk. A short daily walk is much better than a weekly hike. Arthritic joints can be aggravated by excessive activity. Of course, take cues from your dog. If he wants to run a bit, let him run. If he’s ready to rest, stop and rest. Moderation is the goal: not too much, not too little. Walking – always a favorite. Choose low-intensity, easy routes. No hills, no rough surfaces, no uphill marches. Hiking –make sure you choose easy smooth trails and go for short hikes. Swimming – a great sport that is easy on the joints. Agility games – if your dog enjoys agility runs, this can be a fun way to keep in shape. Concentrate on the games that have less impact like balance beam, chutes and tunnels, and running around obstacles. 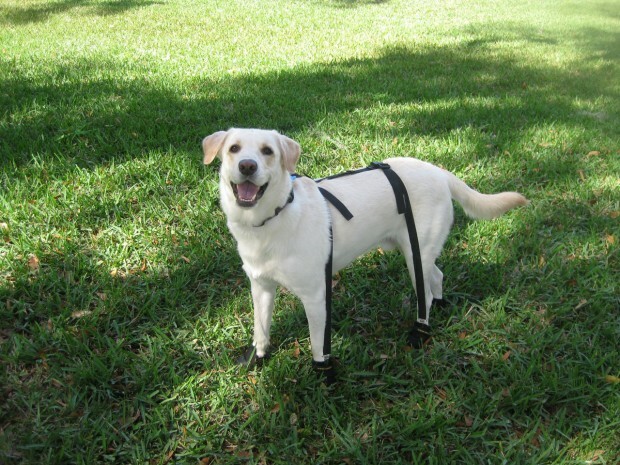 In addition to glucosmine, fish oil and other remedies, the Snuggy Boots Suspender System supports your dog’s joints. 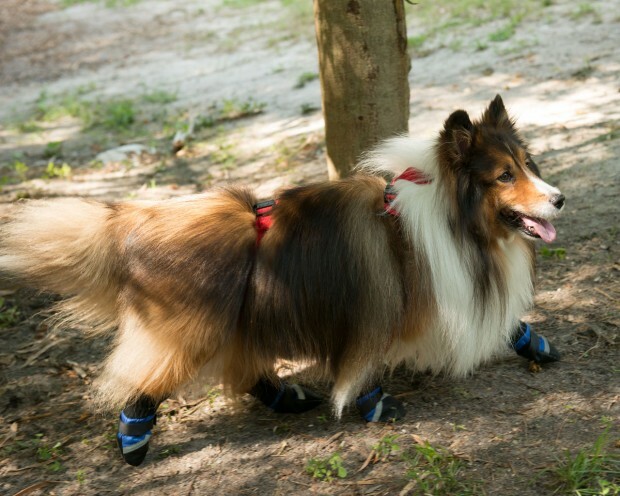 When adjusted properly, the tension straps help “lift” your pet’s legs so they can walk easier. You will find your dog walks further faster and enjoys walks more. Dog arthritis doesn’t have to keep your senior dog on the porch. With the right care, your dog can still enjoy an active and full life.